Based on the novel by the name, the thriller Puerto Vallarta Squeeze, was a story that never should have happened. No matter how good a film may be, I can not get into it when there is a huge and obvious plot hole. The film wasn't terrible, but it could have been so much better if they had just eliminated the obvious! 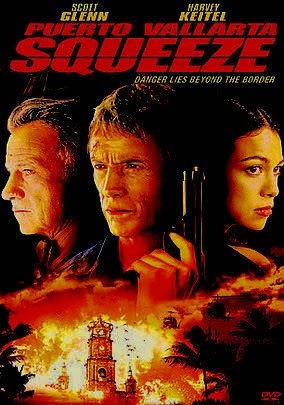 Scott Glenn stars as a CIA hitman, who after executing his target, kills a potential witness, someone he shouldn't have killed. Following orders, his team leaves him stranded in the small Mexican city of Puerto Vallarta. The hitman needs to get back to the states and decides to pays a couple to take him on a ride to the boarder, never informing them that the Mexican authorities, as well as the CIA, are chasing him. What doesn't make sense to me, is if this guy is such a big time hitman, and he's on the run, why not just steal the car? It really wasn't necessary to drag this couple into it, when all they did was slow him down. This could have been a terrific action thriller, instead it was full of this non-sense, involving this random couple. Scott Glenn stars, and he's one of these guys whose name you don't recognized, but who has had minor roles in huge films for decades. Even I didn't realize until I looked him, but Glenn was in The Silence of The Lambs and The Hunt For Red October. He was very good, but the problem was that it wasn't believable. He wasn't injured, he didn't know these people, and there was no reason for him to take them along. They hindered his getaway and just destroyed the story. Also worth noting is that this was the last film to feature teen heartthrob, Jonathan Brandis, who killed himself in 2003. I've always liked Brandis, as he had a major role in one of my favorite TV shows, Seaquest DSV. He didn't get much work as an adult, which is considered to be one of the major reasons behind his suicide, but it was interesting to see one of his few adult roles. He didn't play a very interesting character, but only ever knowing him as a teen, I really wanted to see what he had become before the tragedy. Puerto Villarta Squeeze had a great back story, but it wasn't the focus of the film. The hitman's interaction with this bizarre couple was, and it just ruined the whole thing.